I found out my dog (really my best friend and daughter) has some big issues with her Pancreas. She began messing in the house again today (which I have been monitoring and taking note of for awhile now) and I finally realized that it’s not going to go away. A while back I took her to the Vet and as prescribed, we gave her a dose of medicine every day for a week to calm her tummy and stop the diarrhea. Here we are. No worms. No reaction to pressure or heart issues. Next step…blood work. It took 8 minutes to get the results. The veterinarian showed and explained the results to me. Everything was normal…except the 2 test results that are of the Pancreas-and her numbers were “way off” as he said. Doc gave her a shot to help with her GI dilemma and feel better. Tonight we begin a new dropper medication that will become twice a day until we run out. I held onto my baby when she didn’t want to stand on the metal exam table. I kissed her cheeks and whispered sweet nothings in her big ears the whole time. Little Bit is 13 years old. My senior year, in 2002, we got her as a puppy from a woman that had to move. Little Bit is a furry-four-legged angel from God above. It is even more clear in the fact that she showed up just prior to the year I lost it, and the soon Bipolar diagnosis. What a friend she has been to me and still is. From cruising downtown with LB in my convertible, to snuggles in bed while doing my homework in high school, AND college, we’ve really been close for so long. I love her. I didn’t really think about the inevitable until later this evening, at my computer in the quiet. I know that if I outlive her, which is very probable, her passing is going to be very difficult. But, hey, I lost my dad last year, so I know that this can’t be any worse than that, which I did survive. The way she loves me…always sneaking around every closed door I’m behind, and how she uses her head and body language to express her undying love for me. Little Bit leans in and sort of curves her head around like she’s letting me know how much she adores me…There’s more. God created Little Bit in her momma’s tiny womb 13 years ago. All good things come from above. He obviously had a plan for this little, black Chihuahua. Now I see it all so clear. I do believe with all my heart that The Lord will take care of my baby. She has emotions, a personality, expresses concern and shares love. It may not be as a human soul, but there is something inside my baby that is beyond this world. I believe our fur babies go on, my friends. I’m not saying It’s in the Bible that all dogs go to heaven, but I do know that our God is ever so loving and merciful. He Himself is the One who sends our precious pets to us to begin with, custom fitted for our unique lives. Look At What I Came Home To! It makes my day to come home to messed up blinds! “It’s 8pm. Do you know where your mommy is?” -Little Bit. Our Youngest Doggy turns 4 today! Today our baby girl, Bella, turns 4 years old! She still acts like a puppy & fights with her sister for her plush, green ball. She loves to snuggle around my neck, belly rubs, & truly completes our family! God bless ya, Belle! We love you so very much! You make our world go ’round! God has truly blessed us with a zoo of children. From our 3 birdies, many salt fish, a 55 gal. gold fish tank, and of course the 3 female Chihuahuas…and they are all in our den! I love animals, their personalities, hearts, and the very souls within them. I also love how Rocky (Parakeet) wags his tail in joy when we meet for the first time daily. I love Oscar’s developing whistles or tunes and eventual talking (male Cockatiel) and J-Bird (Yellow female) isn’t so bad even tho she is very moody 99% of the time, haha. My 3 dogs made for wonderful unofficial emotional support dogs. How Great is our God! He has made such beautiful things…I am so blessed. I’m In a Cute Mood Today…for my Dogs! My youngest, Bella, loves to be held and snuggled with more than the other two. The problem is, she has the shortest, little legs. So, I have to pick her up 99.9% of the time. That is fine with me! Every dog has its own personality. Bella makes me happy. It is impossible to look at Bella and not smile, and then laugh when she flops over for a tummy rub! She’s not so good at taking Selfies yet. I can’t make this post and leave out Big Sister, Lou Lou! Here is a very cute and funny clip of Lou Lou…Here I am asking her if she wants to go visit her Grandma and she gets so excited, lol. 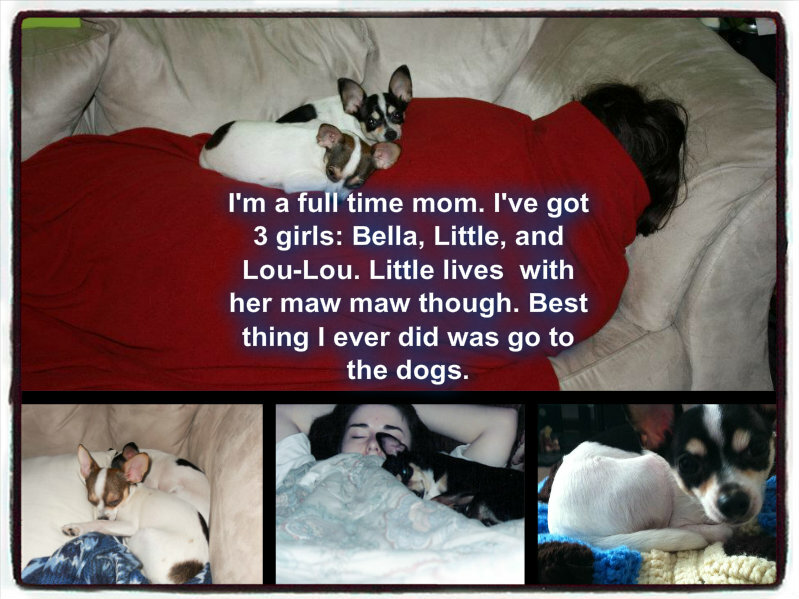 -food: pickles, -thing: having her belly rubbed, -place: in bed with mommy, -person: Josh (one of my brother in laws), -pet peeves: being held too long, and finally, Bella would like a shout out to her big sis, Lou Lou. Bella is such a blessing and life wouldn’t be the same without her! Sometimes God sends Angels to Earth in a Furry Form. My chunky, soft and sweet baby, Bella. She always knows what I need. I love her so much. Its after midnight, which makes it the 19th of February, so I suppose I can post this now since its official. Twelve years ago, this day, one of my closest best friends was born. However, I didn’t meet her until she was six months old in August of 2002, I’m pretty sure. This dog was sent by God above to me, personally. This is not the first time I’ve posted about my four-legged best friend on this blog. I have mentioned her several times as well in various posts. I have never had a pet this long in my life. Little Bit is a family member, a human in the form of a furry, four-legged creature made by God. Like all other animals, she has a soul. I hope to one day see her in Heaven. Spending forever with Little Bit would be very Heavenly! She was there for me from the troubled end of my high school experience, through my college mania, diagnosis of Bipolar disorder in 2004, and the years of depression and continued Bulimia that followed. I don’t know how much longer Little will be with our family, even one of our human members could go first though as far as that is. No matter what happens, she truly changed my life. Little Bit is proof that our Living God gives us everything we need. I didn’t know then just how amazing she would be for me, and looking back, Little is one of the most major blessings in my 28 years. The photo I am sharing was taken many years back before her eyebrows and all the brown on her body turned white with age. She is still beautiful, with a soul that radiates her deepest love and kind heart. Thank you, Heavenly Father for sharing this ever precious, little angel with me. I love you. In Jesus’ Name, Amen. The Joy of a Dog. Always trying to figure me out, always concerned, always a blessing, always my BFF. Its Lou Lou and Bella. My dogs! Our 3 year old Chihuahua, Bella and I have grown very close over this last year. Now that I am feeling better about myself, and about life, I can really be there for her, the way I couldn’t before in a deep depression. I don’t think I would love a human baby any more than I love my Bella.